Bot. Mus. Leafl. 7: 79 (1939), nom. inval. Accepted Scientific Name: Ananas ananassoides (Baker) L.B.Sm. Origin and Habitat: Brazil, Paraguay, Venezuela and in many tropical areas of South America at east of the Andes and in central America. Habitat: It isa terrestrial species found generally in savannah or in low-shaded forest, growing well on soils with limited water holding capacity (sand, rocks) and forming populations of very variable densities. However, a few genotypes thrive in dense rain forest and along river beds (in the Guianas and Costa Rica). Ananas comosus subs. microstachys (Mez) L.B.Sm. Description: Ananas ananassoides is a small to medium size species in the genus Ananas (pineapple) which contains 5 to 8 species and belongs to the family of the Bromeliaceae (Bromeliad Family). It is the most common wild pineapple and the botanical variety that shows the highest genetic diversity; it is very probably at the origin of the cultivated pineapples The plants grow to a height of approximately 0,9 meters (flowering plant over 1 m high). Some dwarf types have been recently cultivated intensively as ornamentals. 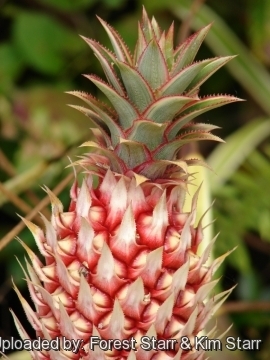 All the species in Ananas were recently transferred as varieties or cultivars of Ananas comosus. This plant is now Ananas comosus var. ananassoides. This plant is monocarpic. Leaves: Many, evergreen, in a spreading rosette at the base of the plant, simple, rigid, generally linear, long-attenuate, acuminate, pungent, 90-240 cm long and not over 25 mm wide above the dilated base; sheaths fresh green, densely ferruginous-lepidote with subdensely serrate margins with curved ascending spines up to 2 mm long. Inflorescence: Scape slender, white-lepidote soon glabrous. Inﬂorescence , many flowered 15 cm long at maturity or usually much less tending to break off the brittle scape at its summit. Floral bracts broadly ovate, acuminate, 15-20 mm long, exceeding the sepals, pungent, serrulate. Sepals broadly ovate, obtuse, 7 mm long. Petals obtuse, 13-17 mm long, bearing two tubular ﬁmbriate scales, purple or reddish. Ovary small. Fruit: The fruit is a small to medium syncarp (“pineapple”), little enlarged globular to cylindrical on a long and thin peduncle, at the end of flowering season in early summer, about 10-15 cm long, often seedy, and its pulp is white or yellow, ﬁrm and ﬁbrous, more or less palatable (depending on clones), but very attractive, with a high sugar and acidity content. Some clones producing a fruit of intermediate size (as compared with the Ananas comosus varieties) found both wild and cultivated in the Guianas. Coma longer than the syncarp at maturity. 1) Forest & Kim Starr “Ananas ananassoides (Cerrado pineapple)”. Plants of Hawaii. <http://www.starrenvironmental.com>. Downloaded on 20 August 2014. 5) Krömer, T. 1999. “Checklist of Bolivian Bromeliaceae with notes on species distribution and levels of endemism.” Selbyana 20(2): 201–223. 6) Smith, L.B. & R. J. Downs. 1979. “Bromelioideae (Bromeliaceae)”, Part III. Fl. Neotrop. 14(3): 1493–2142. 7) Mostacedo C., B. & Y. Uslar. 1999. “Plantas silvestres con frutos y semillas comestibles del departamento de Santa Cruz, Bolivia: un inventario preliminar.” Revista Soc. Boliv. Bot. 2(2): 203–226. 12) Rauh, W. 1981. “Bromelien”. 327. 13) Smith, L. B. & R. J. Downs. 1979. “Bromelioideae (Bromeliaceae).” In: Organization for Flora Neotropica, ed., Fl. Neotrop. Monogr. 14(3):2052–2054. 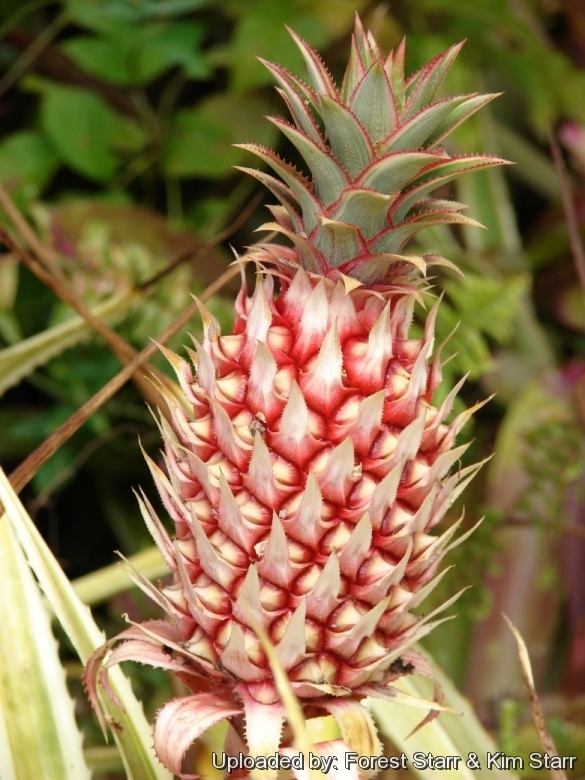 Cultivation and Propagation: Ananas ananassoides is an valuable ornamental bromeliads due to the beauty of the foliage and of the inflorescence, fruit and the facility of cultivation. Exposition: It prefers a sunny site but tolerates partial shade. Watering: It enjoys constant moderate moisture from rain or sprinkler, but allow the plant to dry in-between waterings whilst in winter it is better to leave it dry, thus avoiding possible rottenness. However it is quite drought-tolerant and may be also planted in dry succulent plant gardens. In dry and hot climate, humidity can be increased with nebulisations utilizing water at room temperature and not calcareous. Requires complete and perfect drainage. Fertilizing: Fertilize every 4-week during the growing season with a balanced fertilizer diluted to ½ the strength recommended on the label. Apply mild solutions (one-quartet strength) of foliar fertilizer at 3-month intervals to both garden and container plants. Hardiness: It is cultivated in open air in the tropical and humid subtropical climate countries, with temperatures which it is good to keep over the 14°C, best 20-24°C , but can withstand light frost for short periods if very dry (hardy down to -2 to -4º C, even if with damage to the foliage) in these situations it will better resist if sheltered by the winter rains, seen that the humidity and low temperatures render it more sensitive to rottenness. USDA Zone 9b to 11. Use: Specimen plant; mass planting; container plant; tropical foliage and colourful ﬂowers. Some ornamental varieties, including variegated cultivars are very valuable landscape plants that require very little care and create exotic tropical look. Propagation: Remove and replant stout offshoots from the base of the parent plant. May also be grown from seed: remove seeds from inﬂorescence and lay them uncovered on a bed of crushed tree fern ﬁber; keep constantly but moderately moist.The seeds should be dipped in diluted sulphuric acid to increase germination rate. Starting from the seed, 5-6 years are needed for the blossoming, whilst at least 3 years are needed by division.